Save the date: The LOC-DB Workshop 2018 will take place at the 6th November, 2018 in Mannheim! The paper Linked Open Citation Database: Enabling Libraries to Contribute to an Open and Interconnected Citation Graph was accepted to the JCDL 2018 and will be presented at Fort Worth, Texas in June. The paper Multi-Model Adversarial Autoencoders for Recommendations of Citations and Subject Labels was accepted to the UMAP 2018 conference and will be presented in Singapore in July. For our Linked Open Citation Database, we develop new approaches to extract reference data from reference lists. One step in this process includes the segmentation of such lists into single references, i.e., for each reference, a bounding box is determined. For training and evaluation purposes we labeled 515 pages containing references from books and chapters. For each page we manually annotated a box for each reference on that page, resulting in a total of 10.722 boxes and their coordinates in XML files, e.g. See here for the complete XML of this page file with all boxes. A very first dump of the citation data we generate in our project is available today: dump_20180118_0910.json (4,17 MB). 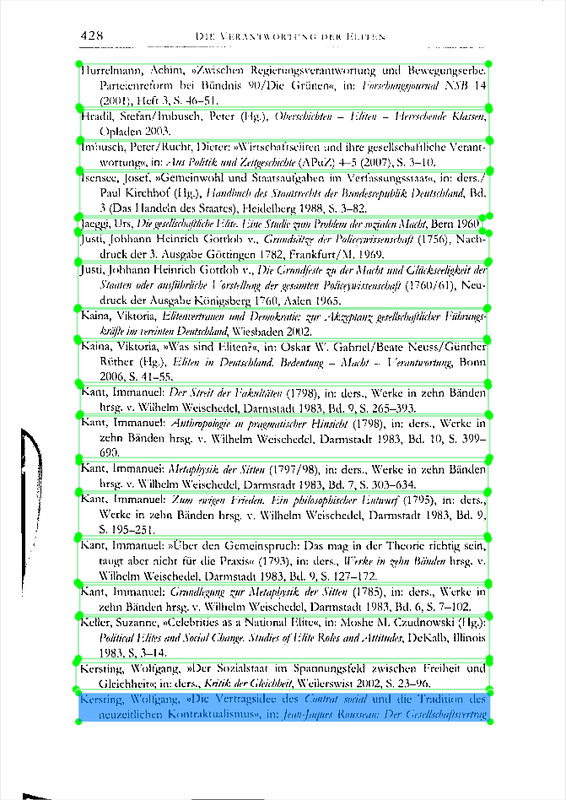 It is not in RDF format, but serves as example showing the qualitity of the citation links. It contains 985 bibliographic resources, with a total of 10,905 references among which 951 are resolved. Anne Lauscher will be presenting the LOC-DB project at the symposium “75 Jahre Zukunft: Bibliotheks- und Informationsmanagement im Wandel” in Stuttgart with a presentation titled ‘Linked Open Citation Database’. The registration for the first Linked Open Citation Database workshop on November 7, 2017 in Mannheim is open.